Google Chrome a Web browser developed by Google Inc. In Computer, dictionary google chrome means including related links, information, and terms. Essentially, Google Chrome and chrome Extension make the things you do on the Internet faster. Chrome is a 10th-year birthday celebration, with the celebration of birthday and google chrome bringing numerous changes for their users. Have you ever thought from which year you have started the use of google chrome? So here I am telling you when Google introduced chrome. Google introduces chrome in 11 December 2008 for Microsoft windows later Google updated Chrome for Linux, IOS, and Android. The first official Chrome OS X and Linux developer preview were announced on June 4, 2009, with a blog post saying they were missing many features and were intended for early feedback rather than general use. In December 2009, Google released beta versions of Chrome for OS X and Linux. Google Chrome 5.0, announced on May 25, 2010, was the first stable release to support all three platforms. Chrome was one of the twelve browsers offered to European Economic Area users of Microsoft Windows in 2010. Chrome now powers Chrome OS, Google’s lightweight operating system for laptops and now tablets. Google has been bringing Android apps over to Chrome OS to make its Chromebooks and tablets more useful. Chrome offers a private browsing option called Incognito Mode. This mode allows you to browse in an isolated sandbox web session. It gives you temporary control over your browsing footprint and session identity, but does not offer guaranteed anonymity. To launch a new incognito browser, press Ctrl+Shift+N (Windows, Linux) or Command+Shift+N (macOS X). Essentially, when you’re in Incognito Mode, the browser doesn’t log what you’ve been doing during your last Internet session. 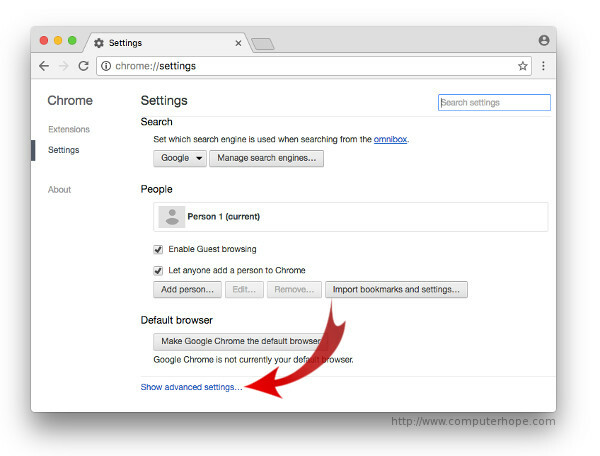 To fine-tune your privacy settings in Chrome, click the icon in the upper-right corner of the browser, and select Settings. The settings interface opens in a new browser tab. Scroll to the bottom and click Show Advanced Settings. The first advanced settings listed are your privacy settings, which make be changed to you’re liking. If you’re developing a website, Chrome Developer Tools are second to none. They allow you to closely analyze all the visual, interactive, and technical components of website locations. To launch Chrome Developer Tools, go the View menu and select Developer → Developer Tools, or press Ctrl–Alt–I (Windows, Linux) or Option–Command–I(macOS X). 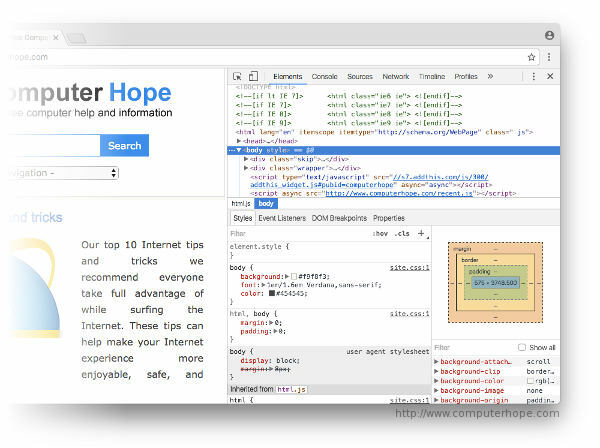 The developer view allows you to navigate the web on one side of the window, and inspect the resource’s components and attributes on the other. 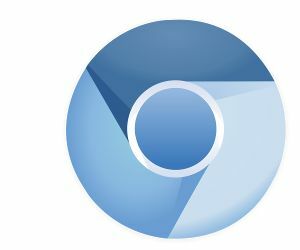 The Chromium Projects are open-source, community-driven projects to develop technologies for Chrome and ChromeOS. 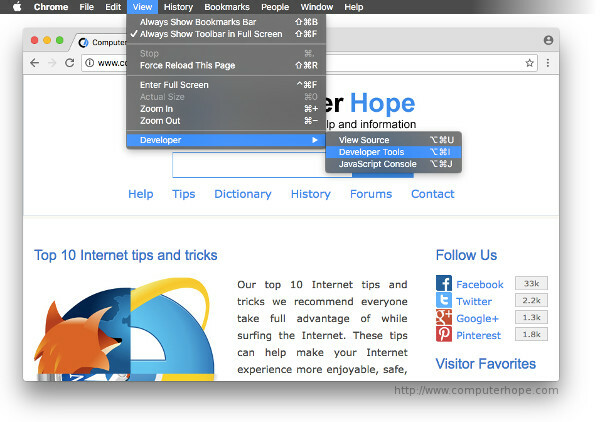 The Chromium browser is similar to Chrome, but is developed exclusively with Chrome’s open-source components. Disable or remove offending services and features that communicate with Google or weaken privacy. Strip binaries from the source tree, and use those provided by the system or build them from source. Add, modify, or disable features that inhibit control and transparency. No judgment. Gogle changed the shape of Chrome tabs so that the website icons are easier to see, which makes it easier to navigate across lots of tabs. On mobile, we’ve made a number of changes to help your browse faster, including moving the toolbar to the bottom on iOS, so it’s easy to reach. 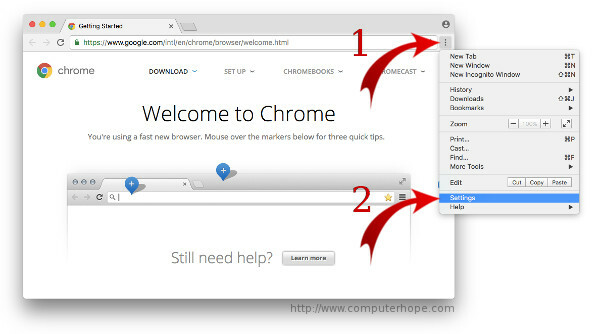 And across Chrome, Google simplified the prompts, menus, and even the URLs in your address bar. Now, Chrome can more accurately fill in your passwords, addresses, and credit card numbers, so that you can breeze through online checkout forms. All this information is saved to your Google account, and can also now be accessed directly from the Chrome toolbar. On September 9, 2009, Google enabled extensions by default on Chrome’s developer channel, and provided several sample extensions for testing. In December, the Google Chrome Extensions Gallery beta began with approximately 300 extensions. It was launched on January 25, 2010 along with Google Chrome 4.0, containing approximately 1500 extensions. Google Arts & Culture turns your New Tab page into your own art gallery, delivering masterpieces of world art right to your browser. Each day brings a new piece of art every time you open your browser, or you can set the extension to deliver a new painting every time you open a new tab. If something sparks your interest; you can click on the image to find out more about an individual piece or artist. AdBlocker Ultimate is a free open source ad blocker that makes much of the fact that it’s beholden to no corporate sponsors or marketers. As a result, it won’t whitelist or let through “acceptable” advertising. The add-on removes advertising such as banner ads, videos and pop ups, while also blocking a variety of online tracking tools. Users do have the option of whitelisting select websites whose ads they want to support. Another useful Checker Plus extension is Checker Plus for Google Drive. It allows users to browse, open, search, or delete their Google Drive files from a browser button without having to launch a new Drive tab. Additionally, Checker Plus can also display desktop notifications for when your shared documents are modified or updated. MailTag provides a series of free, helpful modifications to the stock Gmail web experience, including email tracking to find out when a recipient has opened your message (complete with real-time desktop alerts), and email scheduling so that you can send your messages at the appropriate hours (perfect for multi-timezone communications). It is ad-supported, and comes with a watermark. A premium tier removes ads and watermarks, while also providing expanded “ping sequences” that allow you to automate the email follow-up process. Microsoft’s OneNote is a great workplace productivity tool, especially when combined with the rest of the Office package. The OneNote Web Clipper extension for Chrome. Lets users quickly clip all or part of a web page for easy reference and editing in OneNote, synced across your devices. The web clipper is a feature-packed tool that can trim away ads and clutter; adjust fonts, highlight text, or grab select images or videos that you can then refer back to in the OneNote app. OneTab quickly compresses all of your open tabs into a single tab page with links to all of the Web pages you had open, allowing you to flush all of the tabs from your browser, while still allowing you to go back to them for easy reference right after. Users can then restore tabs one at a time or all at once. Users can also easily export their tabs into a list of URLs or a web page for easy sharing. Boomerang is a fantastic addition to Gmail’s basic functions, allowing users to schedule message sending, set up recurring email messages, and postpone emails. Free users can schedule 10 messages a month, while subscribers gain unlimited message credits and a variety of premium features. VideoStream is a handy Chrome extension that allows you to stream videos from your computer straight to your Chromecast or Android TV without having to mess around with media server software. It also supports subtitles and a wide variety of video formats at full 1080p resolutions. It’s a surprisingly capable video player for a browser extension. Premium users can set up playlists and other premium features, and mobile remote apps provide playback controls and library navigation; also allowing you to step away from your HTPC or laptop and settle in for a long night of viewing. Evernote is one of the most popular note-taking tools available, and its powerful Evernote Web Clipper allows users to quickly and easily save Web content from their Chrome browser straight into their Evernote notebooks. Clip full articles or Web pages, or save more optimized, distraction-free versions. This powerful extension also lets you take screenshots, save as PDF, and mark up content and images. While Google Translate is already an excellent Web service for translating snippets of text to and from languages, the addition of a Chrome extension allows you to translate entire pages with a toolbar button. The extension automatically detects whether the site you’re on uses a different language from your Chrome default, also it can offer to translate it automatically. Users can also easily translate snippets of text, as well as listen to the proper pronunciation of translated words and phrases.